I’ve already written extensively on my blog about how much I hate scammers (and if you missed it or need a refresher, click HERE, and HERE, and HERE), so I’ll keep this post short. If I actually had to sit down and make a list of the people that piss me off, spammers would be pretty close to the top, just behind scammers and people who abuse positions of power for their own personal gain, and just above lazy people with an overdeveloped sense of entitlement. Email spam is bad enough, all those idiotic messages filling up your inbox with special offers for Viagara or urgent account notifications from dummy sites that look real, prompting you to please enter your username and password so the hackers can gain access to your personal information. It is estimated that 80% of all emails sent are spam, and Bill Gates receives an average of 4 million spam emails a year. Who the hell are these people? How do they have this kind of time on their hands? And what, really, do they gain from this? As if the email spam wasn’t bad enough, now that I have my own websites and blogs for my writing and photography business, I am also the lucky recipient of blog comment spam. I don’t know what irritates me most about this crap–the fact that I get a notification email every 45 minutes when one of these spammers tries to post comments that requires moderation, or the fact that there is always at least one word in the comment that is blatantly misspelled. Tonight’s 365 Project entry is NOT dedicated to the dweebs who have nothing better to do than send out ridiculous spam messages. Get a life, a job and a new hobby you delinquent morons. You’re really not impressing anyone but yourselves. Previous Entry 365 Project – Day 273 – What’s Wrong with the 2011 Cornhusker Football Team? Stop Spam by any means possible http://graphiclineweb.wordpress.com/2011/09/30/more-on-spam-comments/. After a few recent posts on spam I even had a blithering idiot trying to tell me spam ‘is not so bad’. Not on my own articles – the idiot didn’t want to use one of his identities to login and ‘give me permission to post on his profile’, but on comments on another bloggers article. Another comment likened blocking spam by any means possible to anti-social acts of violence… I ask you! And now the latest spam thing – Spam Blog Posts… Readomatic is currently full of rubbish articles promoting kindle accessories – which appear to be the same organisation using several blogs to promote their Amazon product listings – At least they only targeted one of my subscribed tags, so I eventually deleted the tag from the subscribed list. WordPress really should put a stop to this kind of abuse of their service. Thanks for visiting my blog, Mike! And thanks for linking to your blog about spam. Lots of great information! 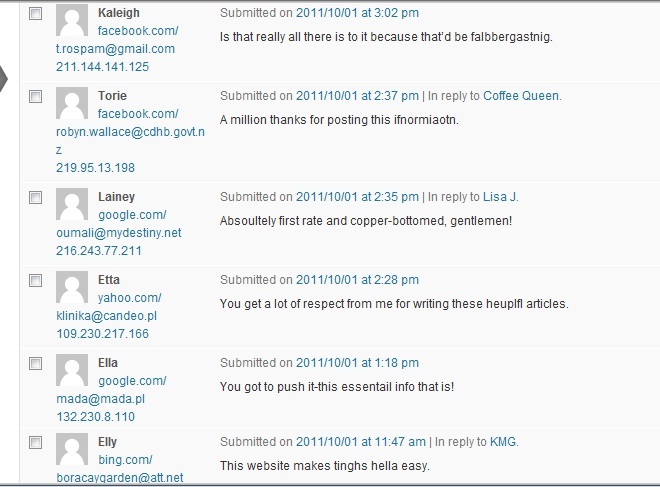 I totally agree about using capcha’s or requiring commenters to sign in instead of being able to post anonymously. It you’re gonig to take the time to make a comment, the extra 2 seconds it takes to sign in or type the word is really no trouble. Agreed Lori – that was my point. Thanks! I’m going to enjoy reading mor of your posts too.